I Got A Copy Through: I bought one! Blurb Description: Cinder, the cyborg mechanic, returns in the second thrilling installment of the bestselling Lunar Chronicles. She’s trying to break out of prison—even though if she succeeds, she’ll be the Commonwealth’s most wanted fugitive. 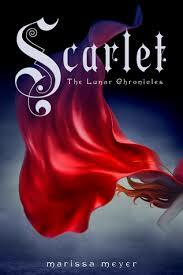 Read my review of Cinder (The Lunar Chronicles, #1) HERE. I think I need to start by saying that THIS SERIES HAS GOTTEN SO MUCH BETTER! I had really hoped that it would, considering the fact that I already own all the books and didn’t like Cinder all that much, and I was REALLY hoping it wasn’t a waste of money, but this one really surprised me. I ADORE retellings, and when one manages to surprise me despite the fact that I already know the story, I can’t help but falling in love with it. I should probably warn all Kai and Cinder fans that, for me, SCARLET AND WOLF are goals! 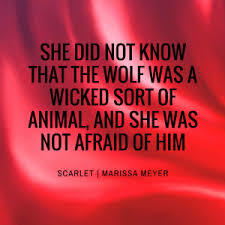 They were SO great together, and well, I loved that she was so brazen and yet hurting and he was this undefeated fighter with wolf senses. I’m sorry, I have a thing for forbidden romances and bad boys. This book picks up literally where Cinder leaves off (If you’ve read the blurb you’ve pretty ruined the whole first book for yourself, but that’s okay, it wasn’t THAT great) and when I opened Scarlet, almost a month after I finished Cinder, I was SO happy to be returning to the uber familiar world, with their portscreens and univs. Scarlet Benoit is Red Riding Hood. Cinder is Cinderella. And now, they’re destined to meet. AND I LOVED EVERY MINUTE OF IT! knows better. There is no way her grandmother would simply abandon her with no word, removing her ID chip and not taking any of her belongings. And then her long lost father shows up at the door, and he says he was taken and tortured by people with numbers tattooed on their hands and then she remembers the mysterious street fighter than had the same tattoo, and as they say, the rest is history. 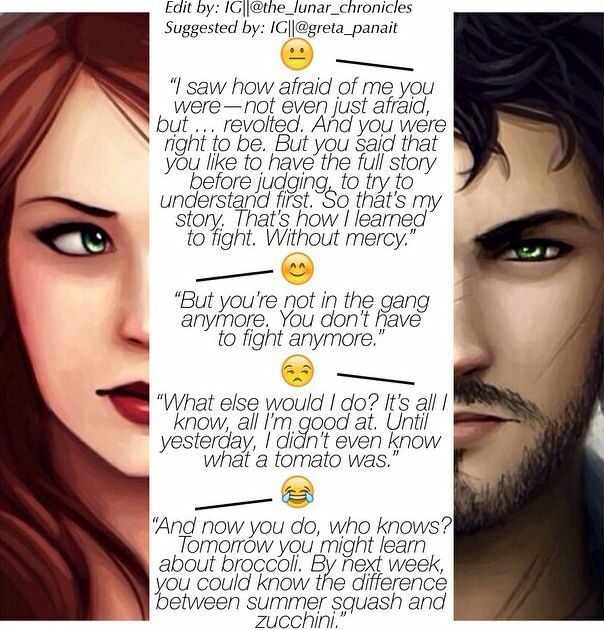 I think I loved the most about this book was the CHEMISTRY! And the fact that there was all this anticipation with Cinder and Scarlet coming closer and closer together, because their paths are destined to cross and I loved watching how the two of them started learning about the other. All in all, I can’t WAIT because it’s finally March and that means that I can read Cress next! EEE! All in all, GIMME THE SEQUEL!